When putting together a landscape lighting design, you will likely include several different types of lights to achieve the overall look you desire. This usually includes a combination of up-lights, down-lights, spotlights, floodlights and path lights that enhance the visual appeal of your yard, highlight particular features, increase security and direct traffic. Spotlights and floodlights are popular options; however, it can be a bit confusing to know the difference and to determine which is best for different lighting needs. To make matters more complicated, one manufacturer’s spotlight might fall into what a different manufacturer would consider a floodlight. Because of this, it is important to understand beam spread and to check the spread on the lights you are considering. This will help you ensure that you choose the right outdoor lights for your project. Outdoor Lighting: What is a Spotlight? Spotlights generally provide a beam of light that is no more than 45 degrees in width and are often less than 25 degrees wide. This is the type of light you often see above a garage door or positioned as an up-light to highlight a specific landscaping feature. Spotlights are generally used to illuminate a particular object, such as a statue, a doorway, an interesting tree or an architectural feature on your home. You may also want to go with a spotlight if you want to contain the light to a specific area, such as a small seating area, without allowing the light to reach a neighbor’s window or to otherwise cause light pollution. 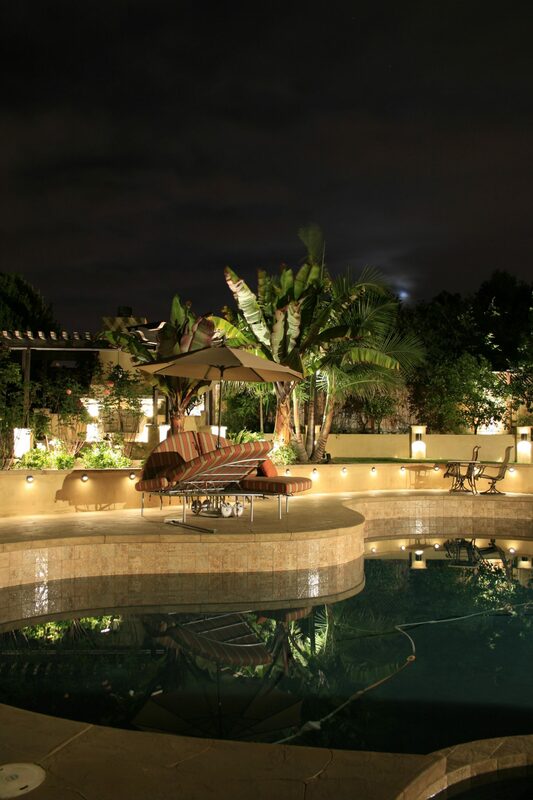 Spotlights are also often used when a landscape lighting design uses both light and shadow to create visual interest. Because they make it easier to direct the light precisely where you want it, spotlights lend themselves well to this type of design and allow your installer to more precisely create the agreed upon look. Outdoor Lighting: What is a Floodlight? Floodlights have a wider beam spread than spotlights and are generally used when broader illumination is desired. For example, you would not use a floodlight to highlight your favorite landscaping feature, but you would use a floodlight to illuminate a parking area or a large patio or deck. Floodlights most often have a beam spread of more than 45 degrees and up to about 120 degrees; however, some lights that are labeled as floodlights may have a beam spread as narrow as 25 degrees. With this in mind, if you are looking for floodlights with a beam angle that narrow, you are probably better off to look at spotlights instead. Aside from lighting your driveway, guest parking area or outdoor living spaces, floodlights are also the perfect choice for using downlights installed high up in trees or on structures to create the look of moonlight bathing your garden, lawn or patio. If you find it difficult to remember the difference between a spotlight and a floodlight, keep this in mind: Spotlights illuminate a specific spot, while floodlights flood an area with light. That just might come in handy when creating your landscape lighting plan.